Need to remove the PAGES from your publishing site URL’s? Thanks to Mark Harrison for pointing me to this new gem coming up in late march.The ‘RAPID for SharePoint’ Classification system will be available in a range of versions towards the end of March 2007. It enables SharePoint 2007 to meet current Public Sector compliance requirements by supporting a range of Taxonomies including IPSV. Also includes a URL rewriting component that removes the unwanted ‘Pages’ element of a typical SharePoint publishing URL. Having been dealing with a major customer in the public sector, I can say that such products will be welcomed with opened arms. * Update, after some mild chit chat over the URL redirection with the WCM experts www.andrewconnell.com/blog | www.harbar.net, it would appear there is much debate surrounding the topic. If you think you’ve been having a bad day/week, just remember it could always be much worse. For the past week or two we’ve been getting absolutely battered with snowstorms. This is the all to familiar scene I woke up to again this morning – an overnight storm taking out power, internet, all that fun stuff. 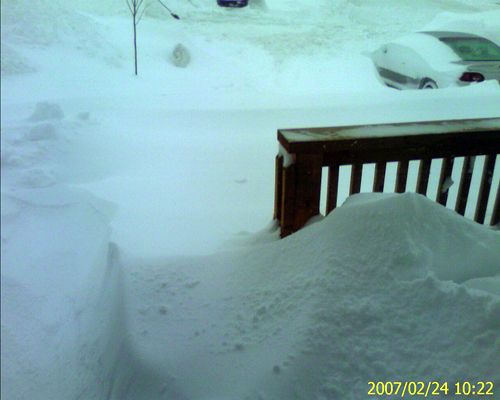 When you start shovelling from your porch, you have to much snow. 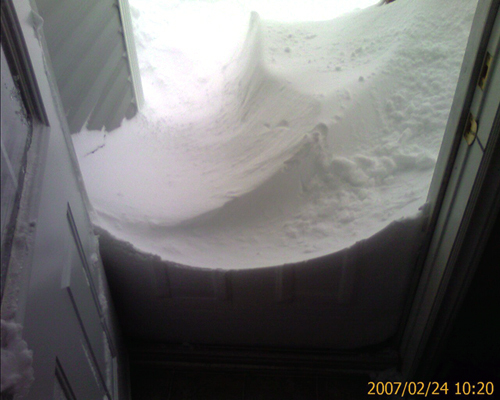 I took this when with my pocket PC-phone when I opened my door this morning. 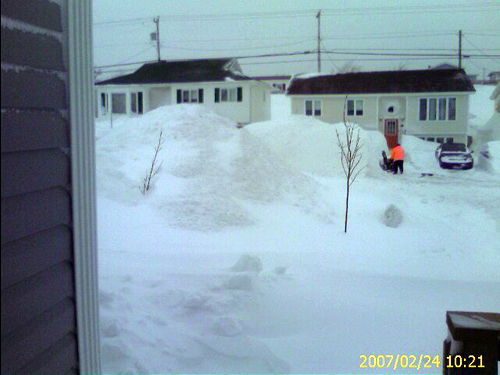 In the 3rd photo – those trees are about 8 feet high, that should give you an indication of how high the snow is. In somewhat funnier news, Amanda and I left this morning to go buy a snow blower and somehow returned with a new Fridge. Go figure. Apple, Inc. CEO Steve Jobs and Microsoft Corp. Chairman Bill Gates, the seminal figures in the development of the personal computer, will make a rare joint appearance at The Wall Street Journal’s “D: All Things Digital” conference this year. The two men will jointly discuss the history and future of the digital revolution in an unrehearsed, unscripted, onstage conversation on May 30 with D co-producers Walt Mossberg and Kara Swisher. Wow it has been too long. My brother reminded me this morning that it has been well over a month since my last post. Time flies eh? Well as Shane wrote this morning, we have been pretty deep on a few projects this past while. Highest in priority of course being the book which is slowly but surely coming to a state ready for release. I truely cannot wait for the point in time when we can sit back and enjoy our efforts and see it released. I am confident it will be excellent handbook for those of you looking to get your feet wet and understand how to effectively use Microsoft Office SharePoint Server 2007 to support your team and organization. The book is very much focused on understanding how to apply the out of the box features to common scenarios and offers a LOT of hands on examples. I know for me this is a way I like to learn which is why I have always been a fan of the WROX Beginner series. In addition to the book there has been an extremely hectic work and travel schedule to keep things moving at light speed pace. I really look forward to having things calm down for a while after March so I can start looking ahead to the rest of the year and making some positive changes in multiple areas of my life…one of which includes getting married which I am looking forward to. Others will be announced when appropriate. Stay tuned! Slowly but surely, a few of the projects over the past few months which I’ve mentioned being involved with (and which have taken up alot of my blogging time) are starting to raise up from the sand. My first post today highlighted the Community Kit for SharePoint (UGE) which is now available. I also just received word that a project that that I was involved with and later asked to co-write, with a colleague (Jared Rypkema) a 3 part building experience article on has made it’s way to the ECM Team Blog and Part 1 of 3 is now available for your viewing pleasure. Without giving to much away, the 3 part article steps you through the highlights (ups and downs) of an application we built a few months (on B2TR) MOSS 2007. It will cover the branding, custom controls, search, localization, etc. I am also happy to say that our book (Beginning SharePoint 2007 – Building Team Solutions) is starting to shape up as we enter the final stages of editing, thanks to hard work (especially from Amanda) and the constant direction of Jim Minatel and crew @ Wiley whom have helped us immensely in trying to keep on track. If you’ve never worked with Jim you don’t know what you are missing, I’ve met him a few times, first in Florida and later again in Boston – he’s just a class act, what can I say. Anyone that takes time from their vacation to fly to New Orleans and help out the Katrina victims is a-ok in my book. Stay tuned – it’s not too far out! As Lawrence points out over on the new SharePoint Community Portal, a project I’ve been heavily involved with over the past while has finally reached an RC1 milestone and we’re looking for critique. The Community Kit for SharePoint (User Group Edition) has been released to the wild as an RC1. What are you waiting for, go take a look and if you are so inclined sign up to contribute to an upcoming version. I have been subscribed to the Microsoft Executive Email for quite some time. While the posts are few and far between, what it lacks in quantity, it definitely makes up for in quality. I had almost forgotten I was subscribed to this feed until today when I noticed a post from Bill Gates come through on Secure Access. Regardless of what you may think of Microsoft, or Bill Gates, one thing is certain, when he writes something, it’s worth reading. During the last decade, digital technology has changed the world in profound and exciting ways. Today we communicate instantly with the people we care about without worrying about traditional limitations of time and location. At work, we collaborate with colleagues in distant cities. Global supply chains enable businesses to manufacture products and move them to market with incredible speed and efficiency. Mobile devices ensure that we are productive no matter where we are. Read the “Enabling Secure Anywhere Access in a Connected World” article on Microsoft’s website.